Photo Award winners receive certificates with an honorarium. Left: Mr. Yonetatsu Matsumoto (President, Fuji Technology Press Ltd., Japan). 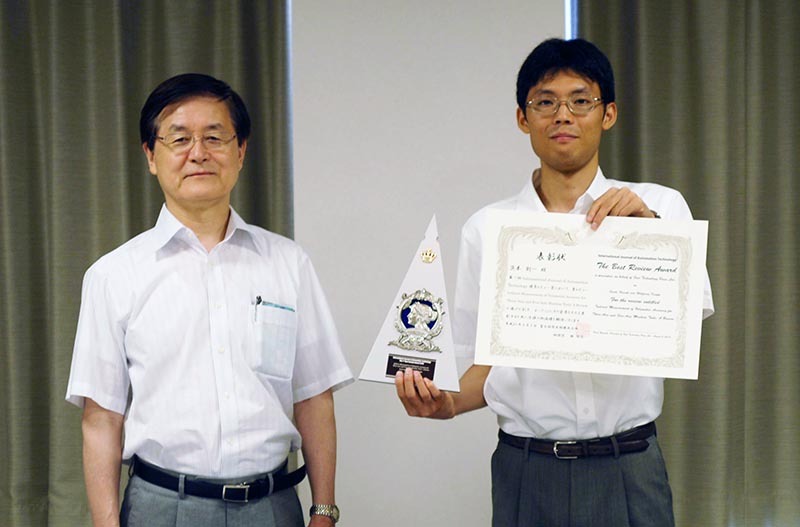 Left-center: Prof. Atsushi Yamashita (Winner, The University of Tokyo, Japan). 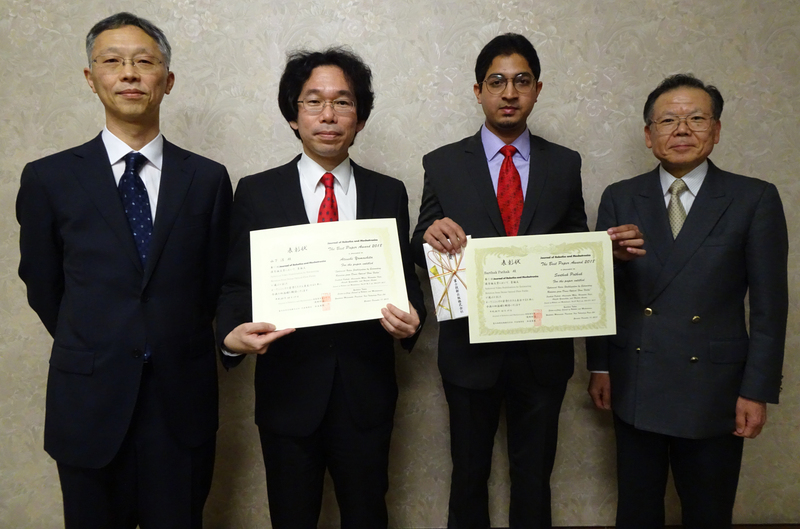 Right-center: Dr. Sarthak Pathak (Winner, The University of Tokyo, Japan). Right: Prof. Yoshihiro Takita (Editor-in-Chief, National Defense Academy of Japan, Japan). Photo Winners, JRM editors, and publishing staffs participated in the ceremony. 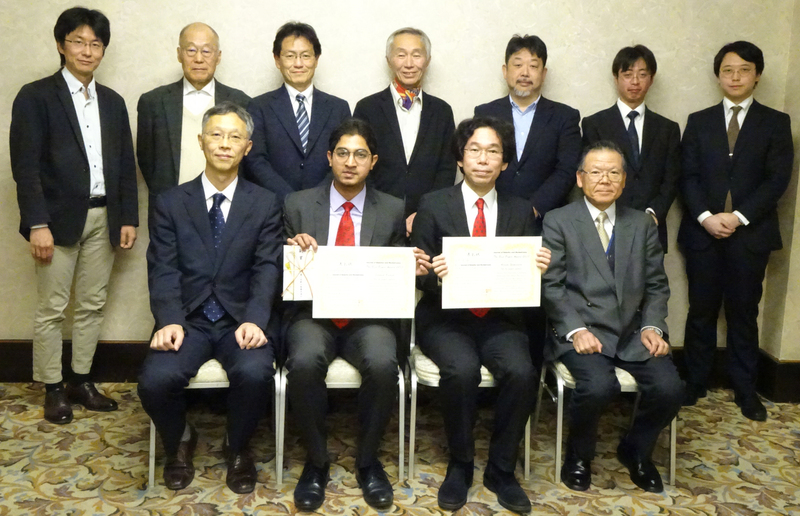 First line from the left: Mr. Yonetatsu Matsumoto (publisher), Dr. Sarthak Pathak (winner), Prof. Atsushi Yamashita (winner), Prof. Yoshihiro Takita (Editor-in-Chief). 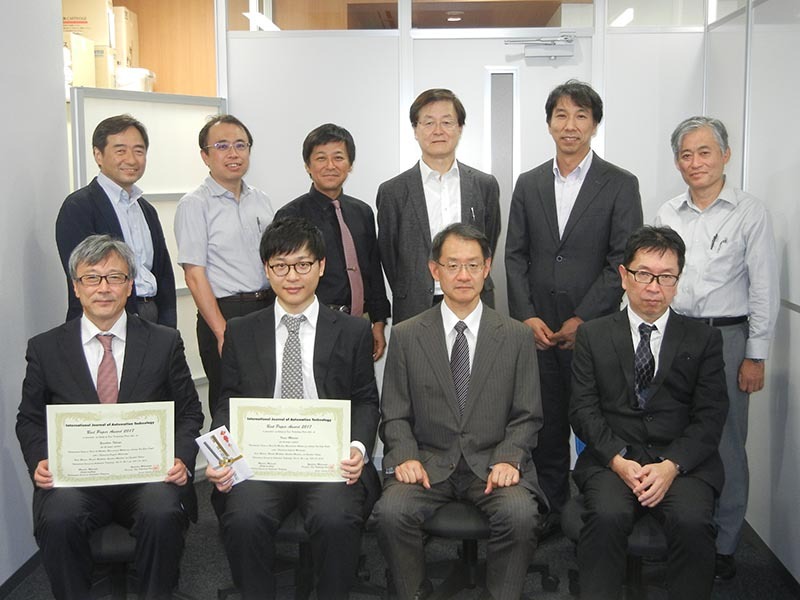 Second line from the left: Prof. Hisashi Date, Prof. Masanori Idesawa, Prof. Koichi Osuka, Prof. Shin’ichi Yuta, Prof. Takashi Kawamura, Mr. Kunihiko Uchida (publisher), Mr. Naohiko Tanabe (publisher). Photo: The Best Paper Award winners receive certificates with a honorarium. 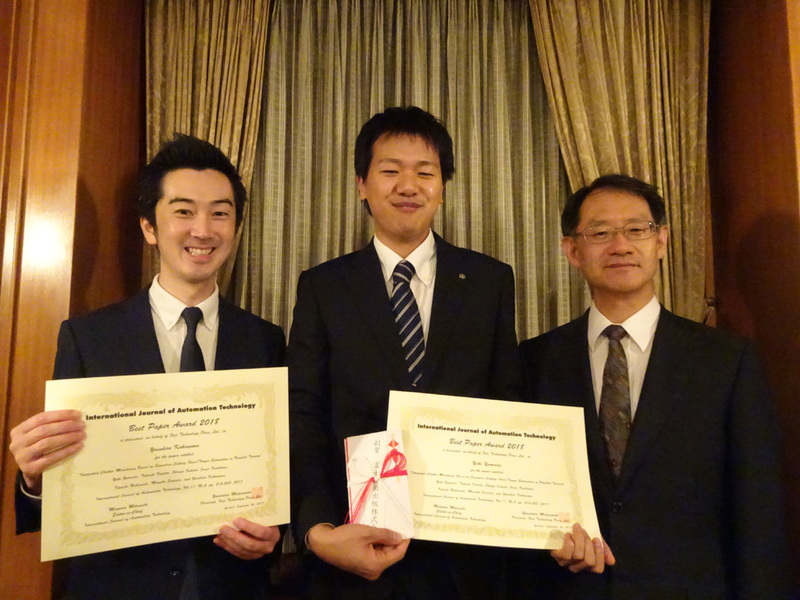 Left: Prof. Yasuhiro Kakinuma at Keio University, winner of the Best Paper Award. 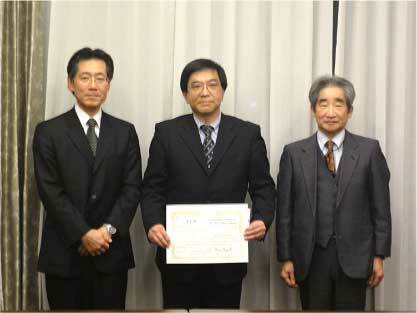 Center: Mr. Yuki Yamada at NSK Ltd. (current), winner of the Best Paper Award. 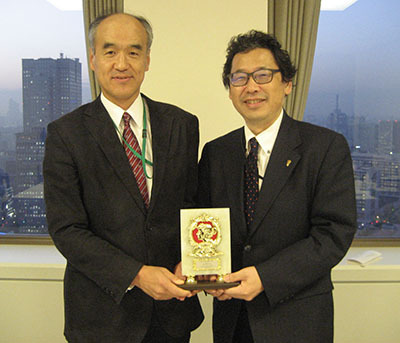 Right: Prof. Mamoru Mitsuishi at The University of Tokyo, Editor-in-Chief. Photo: The Best Paper Award winners, IJAT editors, and publishing staffs. 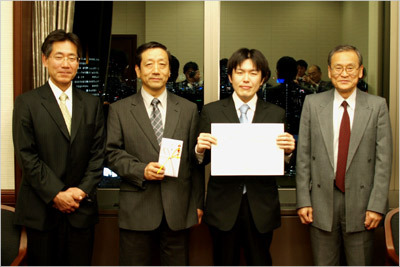 First line from the left: Prof. Atsushi Matsubara (Deputy Editor-in-Chief), Prof. Yasuhiro Kakinuma (winner), Mr. Yuki Yamada (winner), Prof. Mamoru Mitsuishi (Editor-in-Chief). 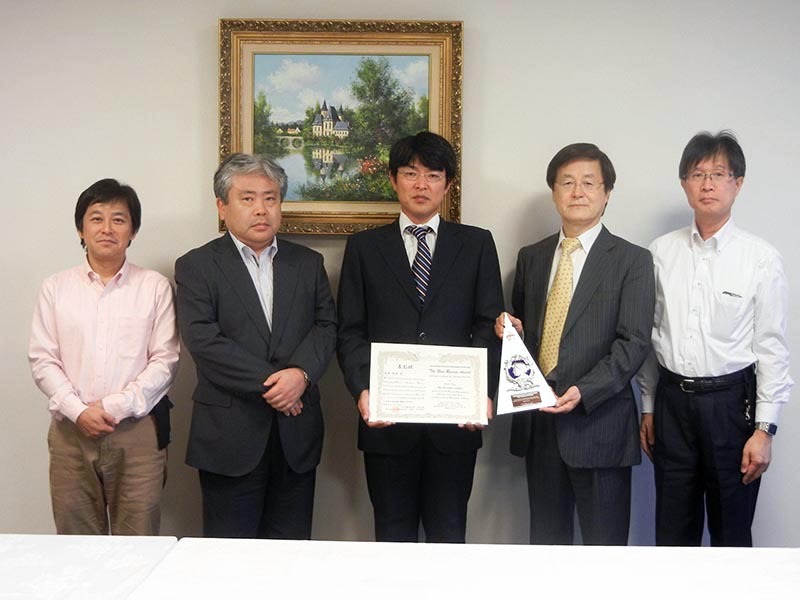 Second line from the left: Mr. Yonetatsu Matsumoto (publisher), Prof. Naoki Asakawa, Dr. Tomohiko Maeda, Prof. Hayato Yoshioka, Mr. Kunihiko Uchida (publisher). Photo: The Best Review Award winners receive certificates with a commemorative shield. Center: Prof. Stefan Wiesner at BIBA. 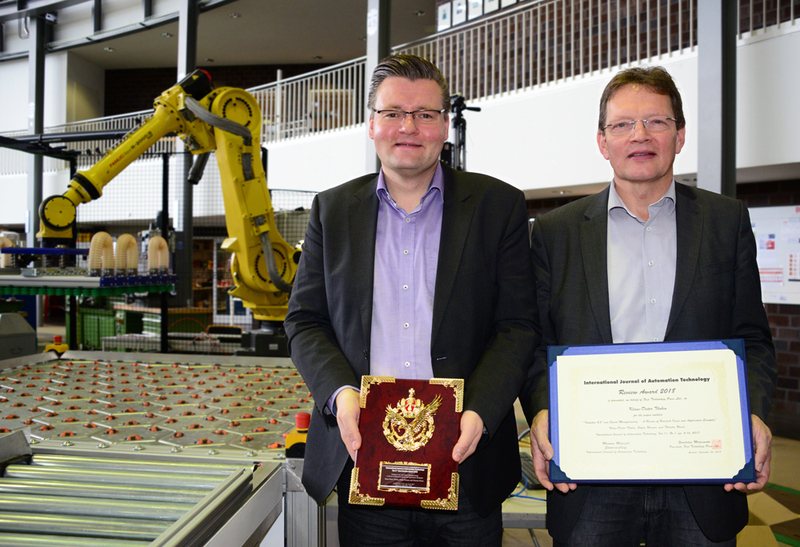 Right: Prof. Klaus-Dieter Thoben at BIBA/University of Bremen. The other author, Prof. Thorsten Wuest also receives a certificate. 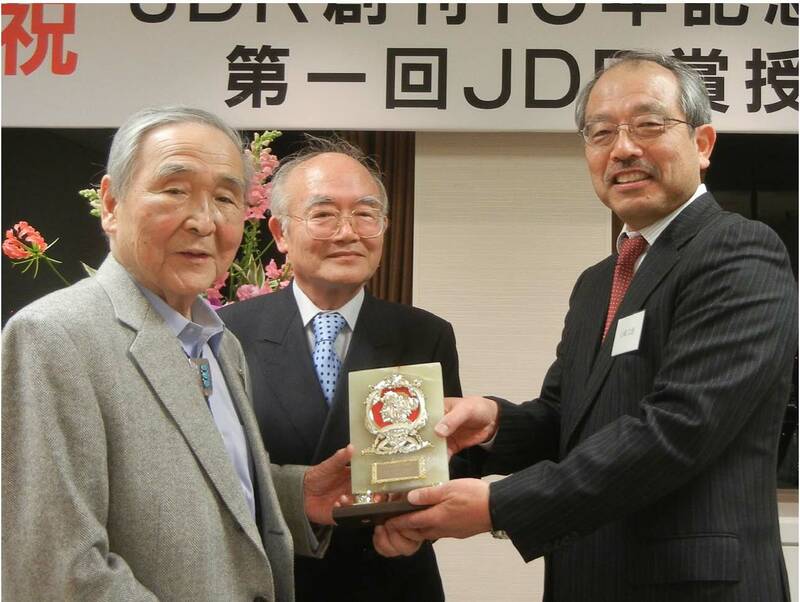 It is our great pleasure to present the Third JDR Award to Professor Shunichi Koshimura for his outstanding contributions to the Journal of Disaster Research (JDR) as the author of 27 JDR articles and the guest editor of three special JDR issues. Dr. Koshimura started his academic career as a young and promising researcher in the field of tsunami disasters. He is now a full professor at Tohoku University’s International Research Institute of Disaster Research, where he specializes in remote sensing and geoinformatics for disaster management. It is our conviction that Professor Koshimura will be productive in both researching and teaching disaster risk reduction for many decades to come, reflecting his rich and profound professional experience with the 2011 Great East Japan Earthquake and Tsunami Disaster. I am honored to receive the Third JDR Award, and I am very grateful to the editorial committee members and staff of the Journal of Disaster Research (JDR). I also wish to express my gratitude to all the authors who contributed to the papers in three special issues entitled “Disaster and Big Data,” which were published in 2016, 2017, and 2018. I really enjoyed the opportunities I had in guest editing the 36 excellent papers in the special issues. My approximately 30 publications in the JDR include the outcomes from the international joint research projects of SATREPS Indonesia, Peru, and Chile, so I would like to share the delight of receiving the JDR award with all the research members of the projects and thank them for their fruitful collaboration. The Journal of Disaster Research all across the wide and comprehensive scope of its outstanding research has provided topical and valuable insights as well as significant implications for disaster reduction and management. I do hope I have contributed to making the JDR an excellent publication of valuable disaster research findings from around the world. 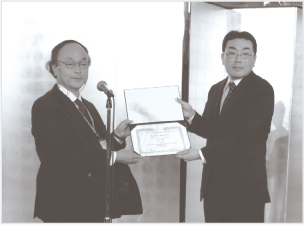 Photo: JDR Award commendation and plaque were handed from the Editors-in-Chiefs, Dr. Suminao Murakami (right) and Dr. Haruo Hayashi (left) to the winner,Prof. Shunichi Koshimura (center). Photo: The winner and JDR Editors at the ceremony. 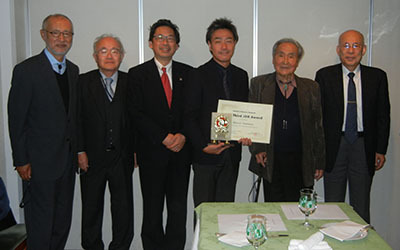 From left, Dr. Hideaki Karaki, Dr. Katsuki Takiguchi, Dr. Haruo Hayashi, the winner Prof. Shunichi Koshimura, Dr. Suminao Murakami, and Dr. Syunsuke Ikeda. Fig. 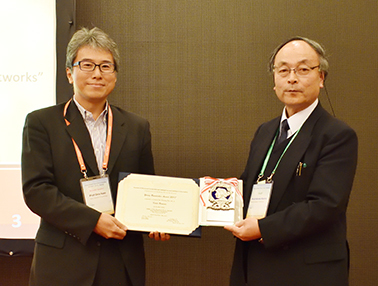 From Prof. Kaoru Hirota (right), JACIII Editor-in-Chief, Dr. Lue-Feng Chen received a plaque of the JACIII Best Paper Award 2017 on behalf of the authors. Fig. 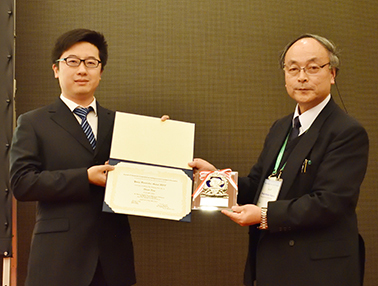 Prof. Isao Ono received a certificate and a plaque of the JACIII Young Researcher Award 2017 on behalf of Mr. Kento Uemura. Fig. Dr. Shuxin Ding, the awardee of the JACIII Young Researcher Award 2017, received a certificate and a plaque. 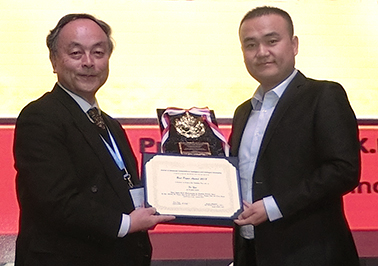 Award ceremony took place at IWACIII2017, Nov. 4, Beijing, China. Photo The award winners receive certificates with a honorarium. 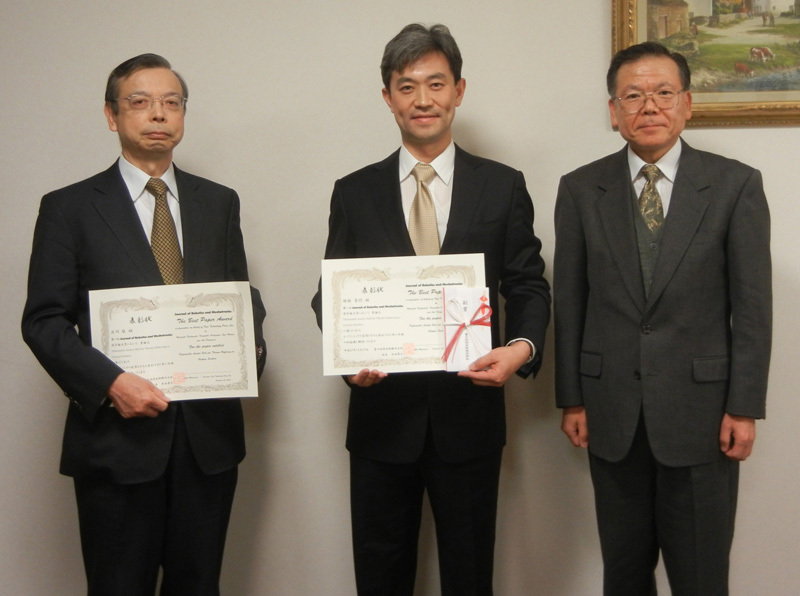 Center: Mr. Kenji Maruno at Hitachi, Ltd., winner of the Best Paper Award; left side: Prof. Yasuhiro Takaya at Osaka University, co-winner of the Award; right side: Prof. Mamoru Mitsuishi at the University of Tokyo, Editor-in-Chief. Photo The award winners and IJAT editors. First line from the left: Prof. Yasuhiro Takaya (winner and editor), Mr. Kenji Maruno (winner), Prof. Mamoru Mitsuishi (Editor-in-Chief), Prof. Atsushi Matsubara (Deputy Editor-in-Chief). Second line from the left: Prof. Hidenori Shinno, Prof. Koichi Morishige, Prof. Naoki Asakawa, Prof. Yoshimi Takeuchi, Prof. Hayato Yoshioka, Prof. Masaru Nakano. Fig. 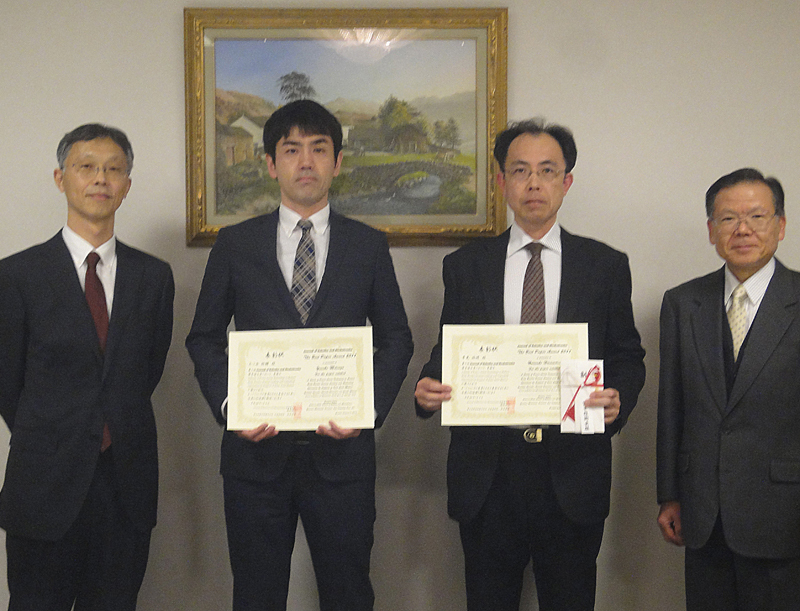 From Prof. Kaoru Hirota (right), JACIII Editor-in-Chief, Prof. Kenichi Fukui received the certificates and a plaque of the JACIII Best Paper Award 2016 on behalf of the authors. Fig. 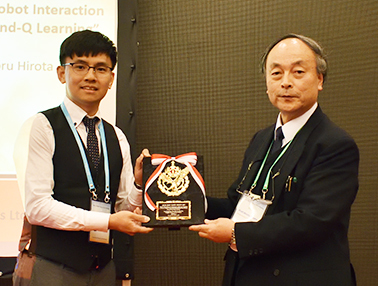 Dr. Chehung Lin, the awardee of the JACIII Young Researcher Award 2016, received a certificate and a plaque. 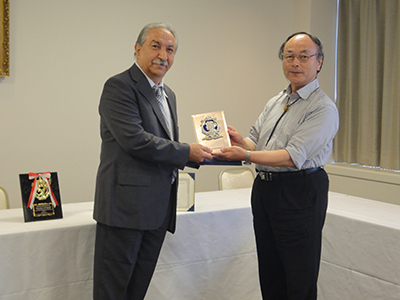 Award ceremony took place at SCIS&ISIS2016, Aug. 27, Sapporo, Japan. I met Professor Harry Yeh for the first time while doing a field survey on the earthquake and tsunami that struck Flores Island, Indonesia in December 1992. He was already a world-renowned researcher, known for his theoretical tsunami research based on accurate hydraulic experiments. I remember that I was deeply impressed with his energetic attitude towards the survey as he worked to reveal phenomena on the disaster site. Since then, I have accompanied him on various disaster surveys, and I have listened to his unique and significant opinions on tsunami studies at many conferences. The two special issues mentioned above reflect his broad range of knowledge and experience. On behalf of the JDR editorial board, I wish to thank Professor Harry Yeh for his efforts and to congratulate him as the winner of the second JDR Award. I am honored to receive the JDR Award and am very grateful to the editors and staff members of the Journal of Disaster Research. I am also deeply indebted to the authors who contributed their excellent papers to the two special issues that I had the privilege of guest editing. One issue focused on tsunami forces and effects on structures (Vol.4 No.6) and the other on uncertainties in tsunami effects (Vol.11 No.4). I organized these special issues in cooperation with professors Shuto1 and Sato2, without whom I could not have achieved such fruitful special issues. 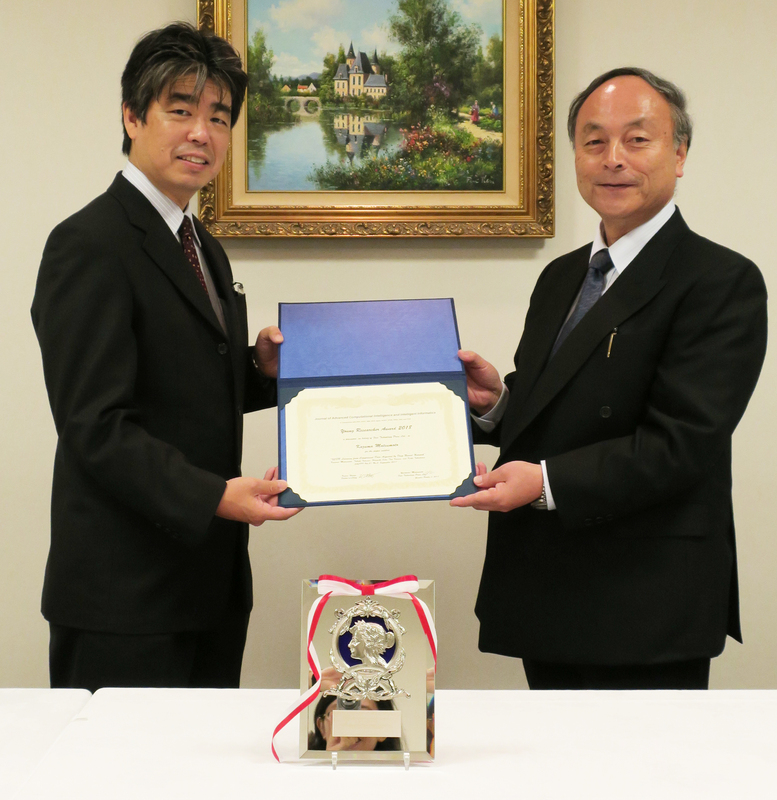 So this award must be shared with both professor Shuto and professor Sato. The Journal of Disaster Research was founded in 2006, immediately after two impactful disasters: the 2004 Great Indian Ocean Earthquake and Tsunami, and the 2005 Hurricane Katrina. The founding of the journal was very timely, and I was inspired when I was invited to serve as an international member of the editorial board. Recognizing that research in natural hazards must be trans-disciplinary and interwoven with expertise in geophysics, engineering, and social sciences, I felt it was difficult to locate a proper arena for reporting research findings. And because natural hazards do not recognize national borders, I felt it was crucial that research be conducted with close international collaboration. In the Journal’s early days, it published collections of papers originating mostly from Japanese research activities. But contributions from other countries have increased dramatically, and today the Journal is in the process of establishing an exceptional reputation, attracting truly outstanding research articles from around the world. The Journal of Disaster Research now serves as an excellent dissemination outlet for cutting-edge natural hazard and disaster research, and I intend to continually contribute to this exemplary international journal. 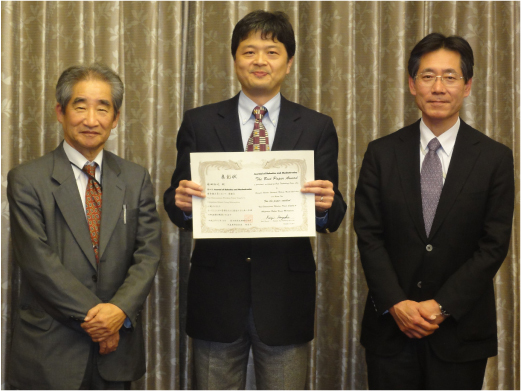 The second JDR Award ceremony was held in Kasumigaseki, Japan, at November 22, 2016 and the certificate was given to the JDR award winner, Prof. Harry Yeh of Oregon State University (Prof. Shinji Sato of the University of Tokyo received it as a dupty). We congratulate the winner and sincerely wish for future success. 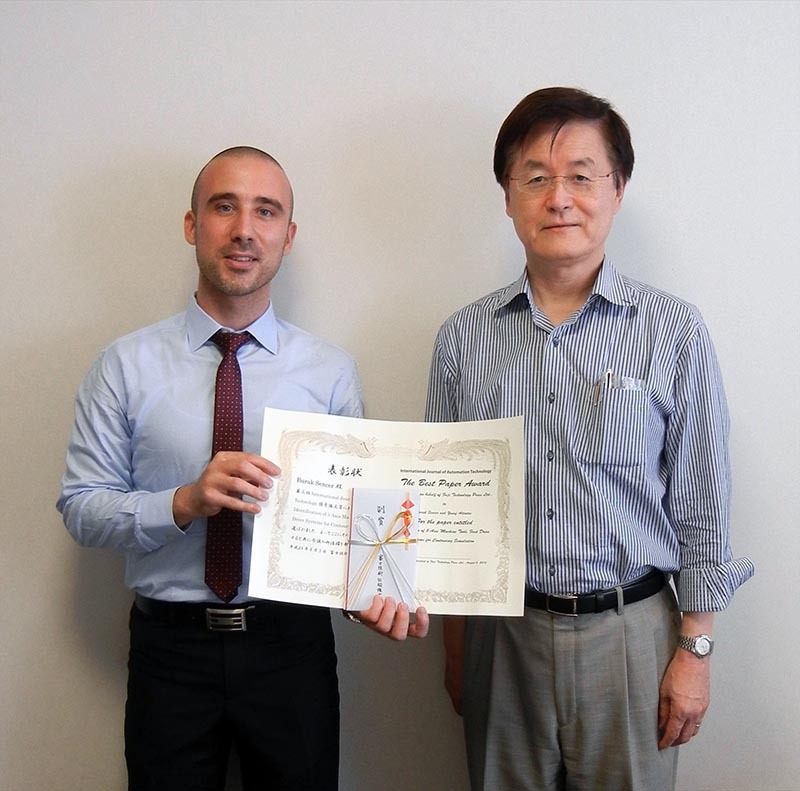 Photo: JDR Award certificate was handed from the Editors-in-Chief, Dr. Haruo Hayashi (right) to a duputy of the winner, Prof. Shinji Sato. Photo: TGroup photo of the ceremony. 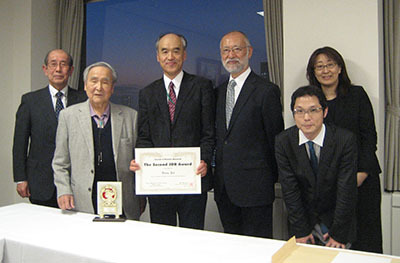 From left, Prof. Sumio Shinoda; the Editors-in-Chief Dr. Suminao Murakami; a duputy of the winner, Prof. Shinji Sato; Dr. Hideaki Karaki, and editorial staffs. Photo Center: Assoc. 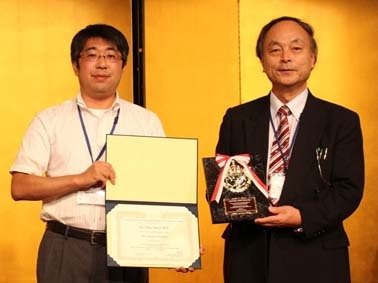 Prof. Yasuhiro Mizutani, substitute of the winner of Review Paper Award; right side of him: Prof. Yoshimi Takeuchi, Editor in Chief. 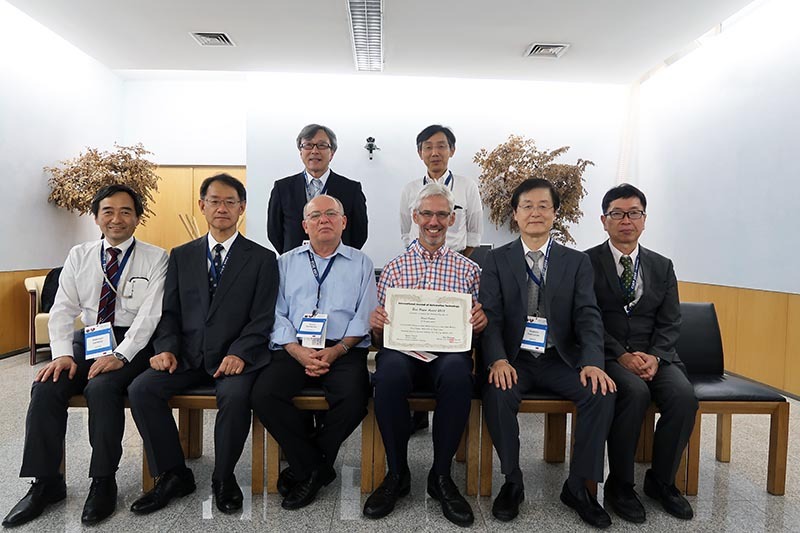 Photo Center: Prof. Berend Denkena, the winner of Best Paper Award; right side of him: Prof. Yoshimi Takeuchi, Editor in Chief. Founded in August 2006, the Journal of Disaster Research (JDR) reached Vol.10 this year. Regular issues are published bimonthly, six times a year. Special editions on the 2011 Great East Japan Earthquake are published once a year, with four of the five issues planned having been published. The JDR’s features lie in its broad spectrum of subjects and the comprehensiveness of their treatment. These points are extremely important in dealing with disasters, but may lose focus in the selection of article content and have difficulty in evaluating it. From its inception, the JDR has made each issue special, focusing on certain topics and inviting specialists in the area to serve as (guest) editors of each issue. Thanks to the cooperation of such specialists, the JDR has developed being able to reach Vol.10 this year. 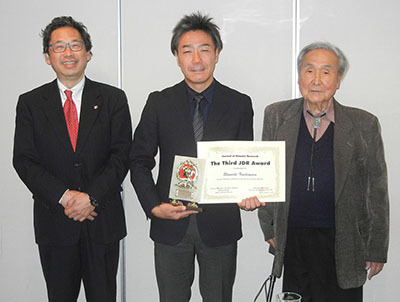 To mark this anniversary, the JDR has established the JDR Award, an idea originally proposed by one of our editors, Shinji Egashira. We feel that having a broad spectrum of subjects is fitting as the selection criterion for the JDR Award, but this has made it difficult to set up objective selection criteria. A major factor in selection has been the number of downloads. Both of the two-part articles on the special issue on “Enhancement of Earthquake and Tsunami Disaster Mitigation in Peru” in Vol.8 No.2 and Vol.9 No.6 ranked among the top ten downloads in the almost 60 JDR issues published thus far. On behalf of the JDR editorial committee, I wish to thank them for their efforts and to congratulate them as the first winners of the Award. We are most honored to have been selected as winners of the First JDR Award – an unexpected surprise because we did not realize that we had contributed so much to the Journal of Disaster Research (JDR). The JDR provided us with a fine opportunity to present our results on a project of the Science and Technology Research Partnership for Sustainable Development (SATREPS), making our work known to the world-wide scientific community. SATREPS is sponsored by the Japan Science and Technology Agency (JST) and the Japan International Cooperation Agency (JICA). From 2010 to 2015, Japanese and Peruvian researchers conducted a SATREPS project, Enhancement of Earthquake and Tsunami Disaster Mitigation Technology in Peru. To announce our research output, we chose the JDR and had our work published in 36 articles in two special issues, in 2013 and 2014. The JDR’s prompt peer reviews and publication processes are really helpful to projects such as SATREPS, which have time limits. Our results would otherwise have been published much later. Congratulations on the JDR’s first-decade anniversary! We believe the JDR is an important journal in the natural hazard and disaster management field as it has been recognized as a Scopus indexed journal. The JDR’s open access and the fact that it enables papers to be downloaded free of charge from the web site is very helpful and convenient to readers and helps authors become known to broader audiences. We hope the JDR will get the Impact Factor of Thomson Reuters, becoming a major source of information in the disaster sciences field. 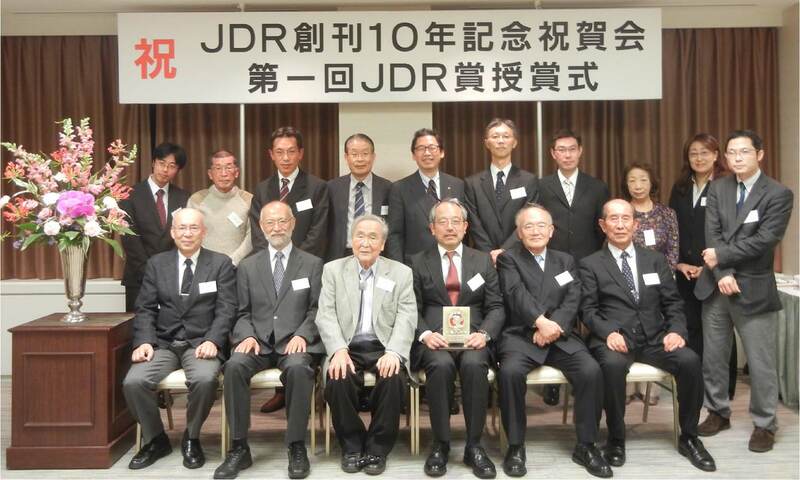 The first JDR Award and JDR 10th anniversary ceremony was held in Kasumigaseki, Japan, at November 11 and the certificate was given to the one of the JDR award winners, Prof. Fumio Yamazaki. We congratulate the winners and sincerely wish for future success. Photo: Participants for the award ceremony. Fig. 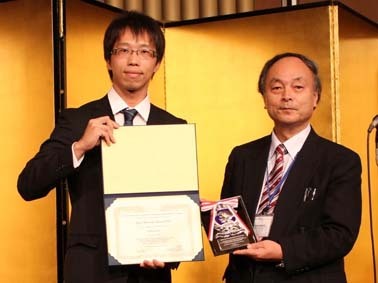 From Prof. Kaoru Hirota (right), the JACIII Editor-in-Chief, Prof. Ken Nagasaka received a plaque of the JACIII Young Researcher Award 2015 on behalf of Mr. Md. Atikur Rahman Sarker. Fig. 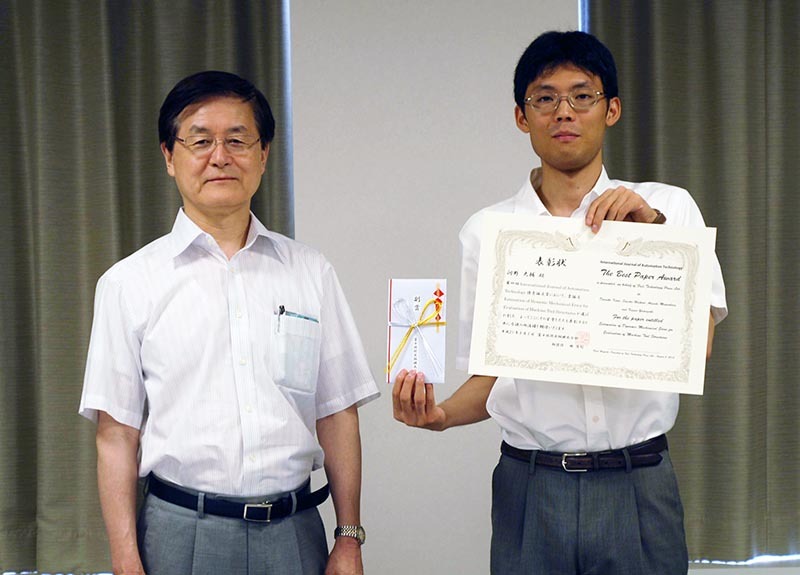 Mr. Yosuke Uozumi, the awardee of the JACIII Young Researcher Award 2015, received a certificate from Prof. Hirota. 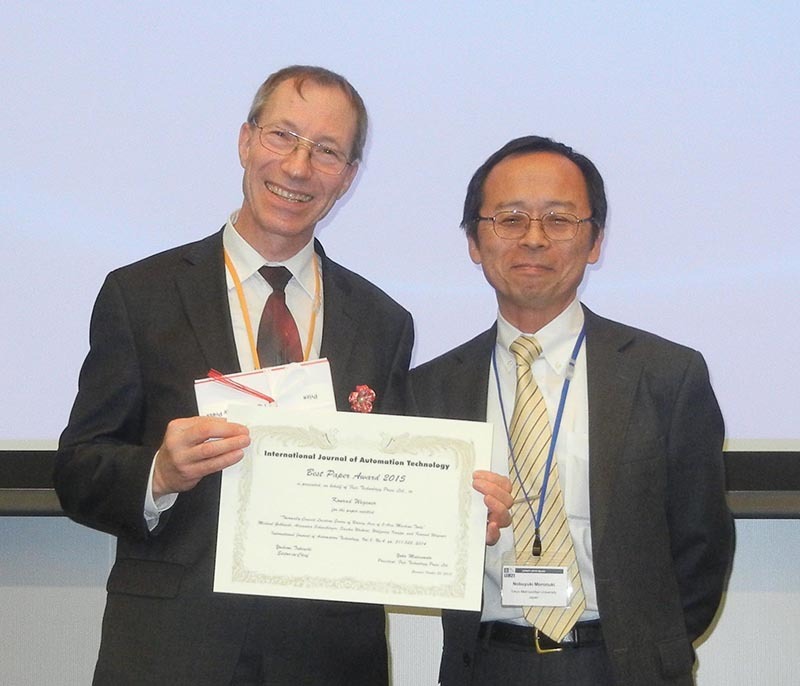 Photo The Best Paper Award 2015 winner, Professor Konrad Wegener (left) of IWF, ETH Zurich and the grantor, Prof. Nobuyuki Moronuki (right) on behalf of IJAT Editorial Committee. Fig. Assoc. 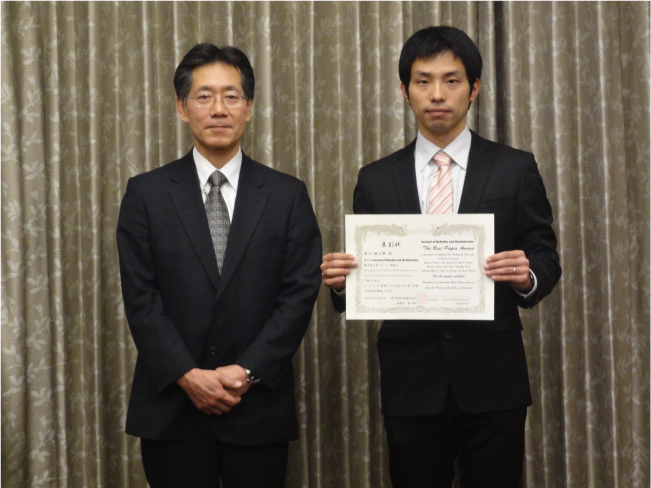 Prof. Yasuo Kudo (right), the awardee of the Best Paper Award 2014, received a certificate from Prof. Kaoru Hirota (left), JACIII Editor-in-Chief, at the award ceremony on Dec. 5, 2014 in Kitakyushu, Japan. Photo The Best Paper Award 2014 winner and members of IJAT Editorial Committee. 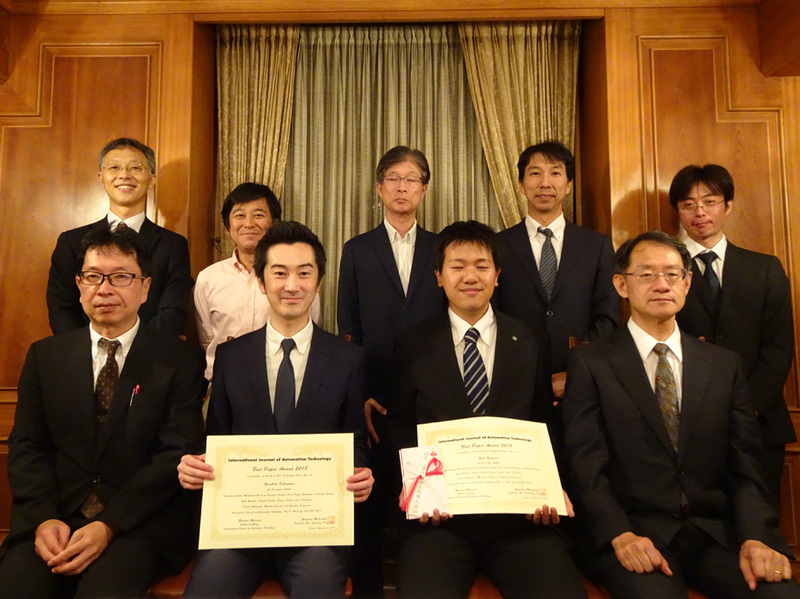 Center in the front row: the winner, Dr. Ryogen Fujiwara of Tokyo Institute of Technology; left side: Prof. Yoshimi Takeuchi (Editor-in-Chief); right side: Prof. Mamoru Mitsuishi (Deputy Editor-in-Chief). Photo From left, Prof. Yoshimi Takeuchi (Editor in Chief), Assist. 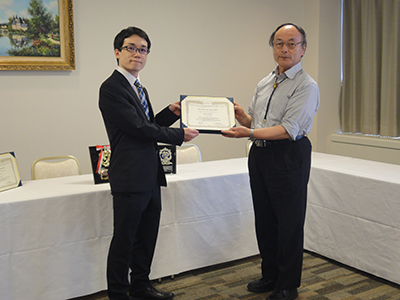 Prof. Daisuke Kono (the winner of Best Paper Award). Photo From left, Prof. Yoshimi Takeuchi (Editor in Chief), Assist. Prof. Daisuke Kono (in behalf of the winner of Best Review Award). 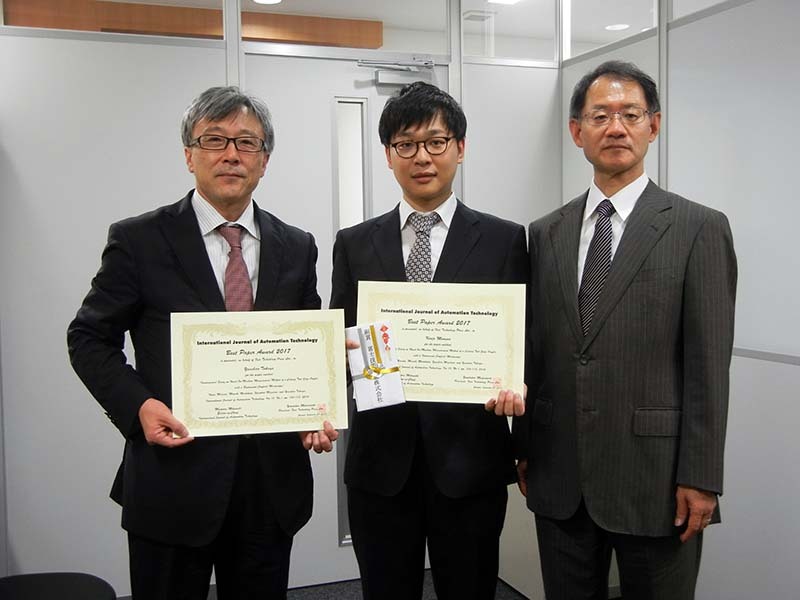 Senior Researcher, Research Department, Cellcross Co., Ltd.
Photo From right, Prof. Yoshimi Takeuchi (Editor in Chief), Prof. Takashi Matsumura (the winner), Dr. Kitao Takahara (Fuji Technology Press). Fig. 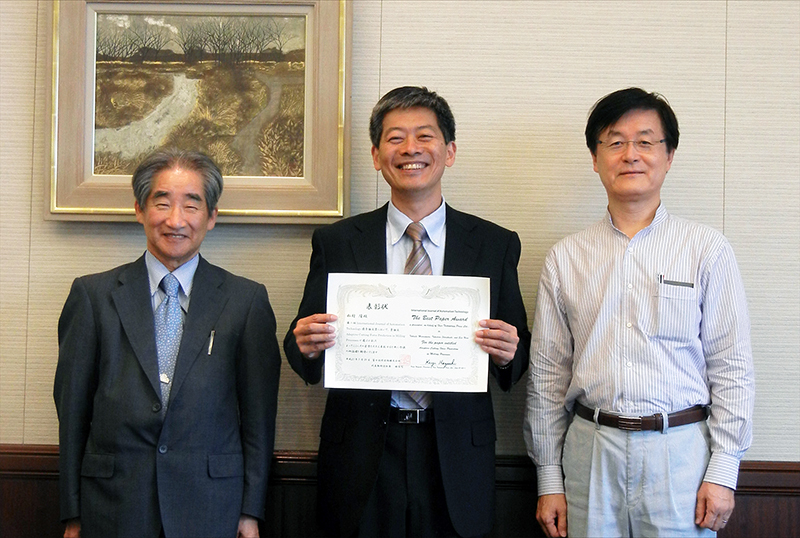 From left: Prof. Tatsuo Arai, Dr. Fumihiro Inoue, and Dr. Kitao Takahara, Fuji Technology Press. 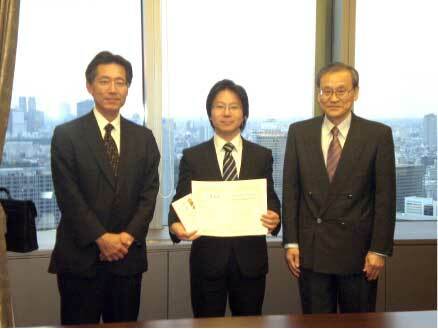 Photo From left, Prof. Yoshimi Takeuchi (Editor in Chief), Assst. Prof. Keiichi Nakamoto (the winner). Fig. From left: Prof. Tatsuo Arai, Assoc. 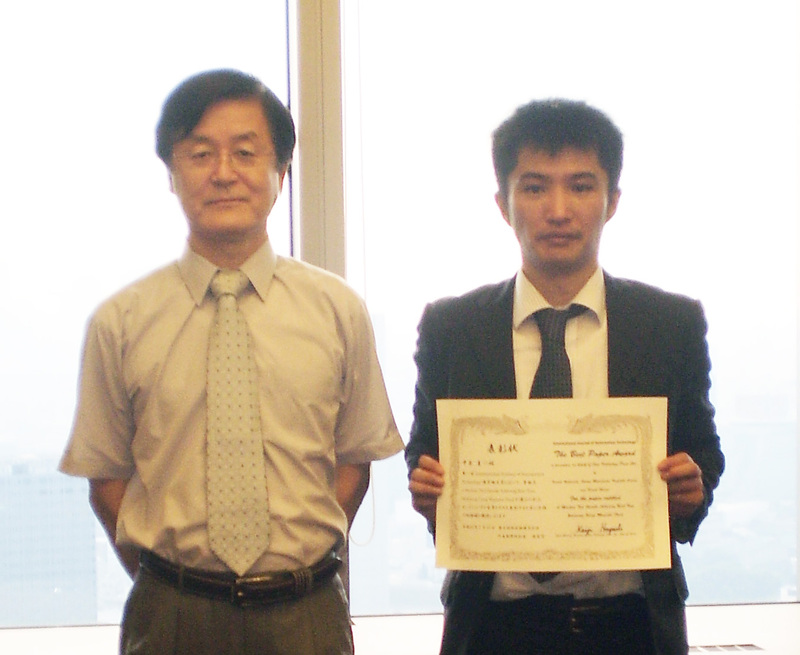 Prof. Masashi Konyo, and Shigeyuki Suzuki, Adviser, Fuji Technology Press. Fig. 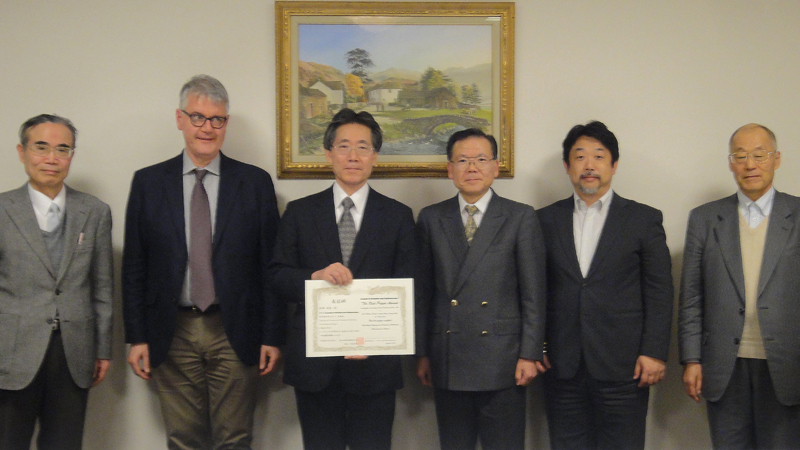 From left: Prof. Tatsuo Arai, Editor in Chief; Prof. Shigeo Hirose; Dr. Ryuichi Hodoshima; and Mr. Shigeyuki Suzuki, Adviser, Fuji Technology Press. Congratulations on having won the JRM Best Paper Award for 2008. We are especially happy this year, as it marks JRM’s 20th anniversary. I am convinced that our being able to award such excellent work as we celebrate this auspicious occasion signifies both a turning point and giant step ahead for JRM. The prize-winning work was selected from among Volume 19 published in 2007. This volume was composed of 88 high-quality research papers, but from among the many excellent candidates one work was chosen not only for its innovation and usefulness, but for its truly unique quality. Perhaps it can be called a fitting work to crown JRM’s 20th Anniversary. 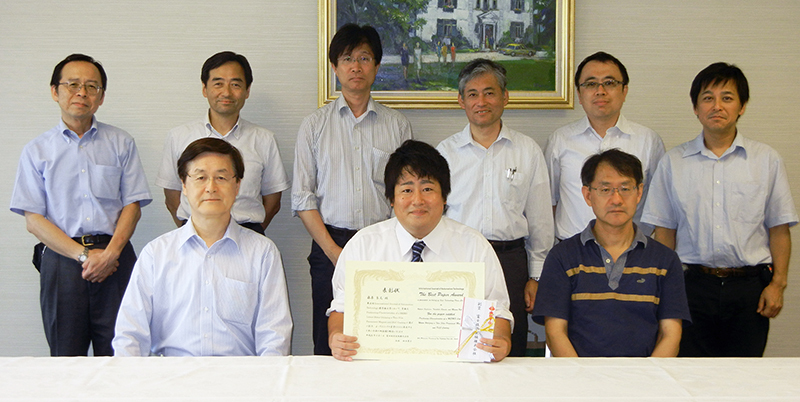 This year’s prize selection was done through the participation of all Japanese members of the editorial board. Our Editor-in-Chief and the guest editors of the special issues selected one or two candidates from each number of Volume 19. These works were then further narrowed down to seven through a careful selection and evaluation process. From among these seven, the February 2009 meeting of the Editorial Board finally came to an agreement on the work most deserving of the grand prize. It is my sincere hope that all the prize winners continue to develop in the future, and that JRM continues to make great strides with you. Lastly, to the members of Fuji Technology Press, Robotics and Mechatronics Division of the Japan Society of Mechanical Engineers, and to the entire editorial staff, I would like to express my sincere gratitude and appreciation.